Labor Day is approaching and that means football season is just days away. The National Football League is wrapping up it’s preseason schedule, roster decisions are about to be finalized, and final preparations are being made for kickoff week. Of course with the new year comes new players, and this year there are some standout African-American talents coming into the game. The 2017 NFL Draft brought 253 new players into the league. Here’s a look at five rookies to pay attention to once the regular season begins on September 7. After only playing two years at Stanford, this 21-year-old was named All Pac-12 Conference, Third-team All-American, and won last year’s Morris Trophy. Picking up 98 total tackles, 24 ½ tackles for loss, 12 sacks and recovering four fumbles always helps. And after the 275-pounder ran a 4.69 40-yard-dash and pushed 30 reps on the bench press at February’s scouting combine, the San Francisco 49ers selected Thomas with the third overall pick. Being drafted so high by a rookie general manager and a rookie head coach means there’s plenty of expectations across the board. The San Francisco 49ers are essentially hitting the reset button going into this season. Thomas will be the defensive face of that reset and his development should be fun to watch. So far in limited preseason action Thomas has two total tackles and a quarterback hit on his stat sheet. This 22-year-old standout from North Carolina A&T was one of only two players drafted from HBCUs this year (the other being Grambling State wide receiver Chad Williams who was picked by the Arizona Cardinals in the third round). The Bears - who have a proud history at the running back position - used one of their two fourth round picks (119th overall) to select Cohen who racked up 5,619 career rushing yards, 945 career receiving yards, and 59 total touchdowns in an Aggies uniform. He earned the nickname “The human joystick” for his ability to weave around opposing defenders, find holes where there are none, and became the Mid-Eastern Athletic Conference’s all-time leading rusher in the process. He’s also responsible for one of the most popular viral videos in the recent memory of college football. His one-handed catch while executing a backflip at the same time helped him get noticed by NFL scouts. The Bears have a stacked depth chart at the running back position for the moment. But Cohen has done everything he can during the month of August to stand out he’s already racked up 19 carries for 121 yards along with two kick returns for 39 yards in three exhibition games. The man who’s arguably Clemson’s greatest quarterback was the most decorated signal caller in this year’s draft. The 21-year-old Watson won last year’s college football playoff National Championship, the last two Atlantic Coast Conference titles, and multiple individual awards all while accumulating 12,102 total yards and 116 combined touchdowns. After the Brock Osweiler failure of 2016, the Texans are starting over at the quarterback position. 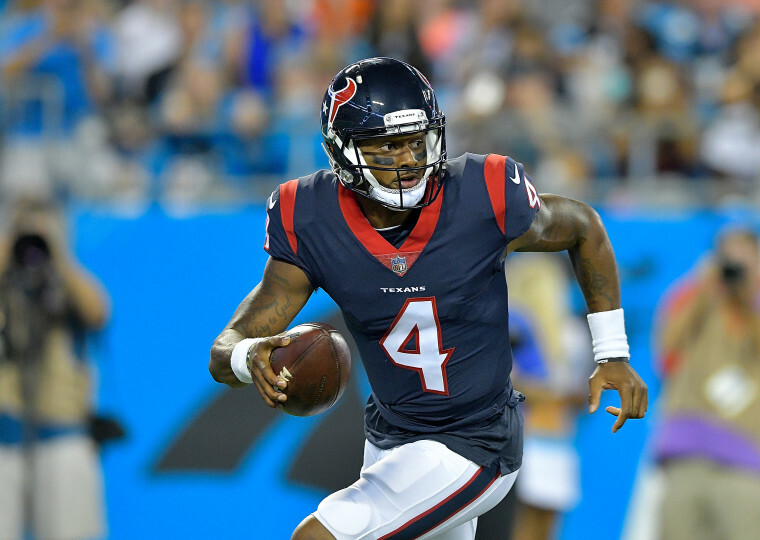 With unproven veterans in Tom Savage and Brandon Weeden being the only other quarterbacks on the roster, many Texans fans are hoping that Watson will take the reigns. While there is no doubt about Watson’s athletic abilities, his ascension won’t be automatic. Especially since head coach Bill O’Brien has already named Savage as the starter for the regular season. But Watson has impressed in his preseason reps thus far as he’s completed 29-of-56 passes for 397 yards while running for another 54 yards. He has a stronger arm than Savage and is more mobile as well. If Savage falters in the early going, Watson will get his chance to shine on Sundays. Kizer doesn’t have the same accolades as Watson but he has similar athletic abilities. He threw for 5,805 yards and 47 touchdowns while running for another 997 yards and 18 touchdowns during his two seasons at Notre Dame. Now Cleveland fans are hoping that the 21-year-old can be the player they need to help turn around the fortunes of this organization. That task will be easier said than done however as the Browns have used 26 starting quarterbacks since the team returned to the NFL in 1999. Kizer will now be No. 27 as he was named the starting quarterback this past week. He soundly and convincingly outperformed veterans Brock Osweiler, Cody Kessler and Kevin Hogan to win the job. The Browns still have one preseason game left to play, but in the first three Kizer led his team in passing yards, completions, and has shown the poise and composure of a veteran signal caller. With some fresh talent on offense to accompany him, Kizer may already be an early Rookie of the Year candidate. Being the number one overall pick in the draft comes with all kinds of expectations. In Garret’s case the expectations are a little higher than most. As teammate DeShone Kizer is part of fixing the offense, Garrett is the face of a defense that is literally rebuilding from the ground up. He’s also the new face of the franchise, a prototype of today’s style of pass rushers, and the hope of a fan base that has suffered for far too long. But these are challenges that the Texas A&M alumnus is willing to meet head on. Browns fans have already gotten a sample size of what to expect from Garrett in the first three exhibition games. Against the Tampa Bay Buccaneers, the New York Giants and the New Orleans Saints this August Garrett has racked up three quarterback hits, two tackles, a tackle for loss and a sack. Opposing AFC North quarterbacks beware. The NFL preseason concludes this Thursday night. Gabe Salgado is a multimedia sports journalist based in Chicago.